Does our pilot "REALLY" know what he's doing? Our pilot/owner Dave Rocke has more than two decades of experience flying in Southeast Alaska and uses his experience, knowledge and unique sense of humor to enliven each flight. Dave has been flying since 1988 and has a top-notch safety record. What is the airplane like? All of our tours are flown in a Cessna 185 equipped with Aerocet floats that is maintained to the highest standards- as dictated by our finicky mechanic and FAA supervision. Our plane has 4 passenger seats, all of which are window seats with great views of the wilderness for you. We have an intercom system for your listening and conversing pleasure. Our plane also features active noise reduction headsets for all seats, enabling you to clearly hear and talk with the pilot throughout the flight. Will you pick us up from the cruise ship dock? Yes! We will pick you up from your assigned cruise ship dock in our red Subaru Outback that reads "Family Air" on the side 15-30 minutes prior to your scheduled departure time. Alternative pickup arrangements can be made upon request. Please be sure to have your cell phones turned on when you arrive to port, just in case we have any trouble finding you. Will you fly in the rain? We will fly in light rains and light winds, but safety and customer satisfaction are always our top priorities. If we decide that the weather is not acceptable to fly in or that you will not enjoy your flight due to weather conditions, we reserve the right to cancel your tour. Our cancellation policy states that if your tour is scrapped due to weather, you will not be charged for your tour if you have not prepaid or you will receive a full refund within a week of your scheduled flight if you have prepaid. Ketchikan is a rain forest, so be sure to prepare for that. Wearing layers and having a rain jacket readily available is a good idea. We recommend leaving your high heels at home and opting for closed toed shoes or boots. We do offer private tours for a small fee. Please call us at 907-247-1305 for more information.  Family Air tours, LLC operates under permits from the USDA Forest Service and is an equal opportunity service provider. When people ask me where I grew up I usually respond, "I don't know". Either I don't feel that I grew up or can't really pick the place where it might have happened. My junior and senior high school years were spent in a small dairy farming community in upstate New York called Cobleskill. College years were misspent in Cobleskill and Albany, New York. In 1975 I moved from New York City to Port Orchard, Washington and then to Bainbridge Island, Washington. In 1982 I wrote some resumes (mostly fiction) and convinced a fishing lodge in Alaska that I would make a good fishing guide and worked the next eight summers guiding in Alaska and goofing off in either Florida, Mexico or Washington during the winters. One of the lodges had airplanes and I saw that the pilots lazed around, drinking coffee, while directing us guides to do their work, I thought, "I like coffee". In 1986 - 1988 I obtained my pilot's licenses to start what I thought would be an easy and carefree existence. Unfortunately I have never found any guides or anyone else who was as easily hornswaggled as I was and so have never realized the life of leisure I aspire to. I worked another two years as a pilot/guide and then nine years for Taquan Air in Ketchikan, Alaska, first as a line pilot, then as Chief Pilot, then as Director of Operations. In 1996 I called up Alice, who I had gone out with 13 years earlier when we were both working for Waterfall Resort on Prince of Wales Island, Alaska. I ask her if she would like to go out to dinner (she was in Colorado, I in Alaska) she said yes and we married a year later. Some women will do just about anything to come to Alaska. In 2001 I asked Alice if we could go into business for ourselves in a one plane/one pilot airtaxi (we had just bought a house so we had lots of free cash). For some reason she said yes and that's how I got here. I've been doing this for 14 years now, and find that it was a great decision, even though I still haven't found anyone to do all the work yet. We'd love to show you this part of Alaska, we specialize in customized trips for you. Please call us for information, whether it's to go see bears, the Misty Fjords/Glaciers, go fishing, go camping or maybe you have an unique idea of your own. I'll share my experience with you and help make your Alaska vacation the one you've dreamed of. Alice died on July 4, 2006 from breast cancer that had spread throughout her body. She was 53. We all miss her very much and I still think of Family Air as her creation as much as mine. While Alice was alive she reminded every woman over 40 or at a high risk for the disease to get annual breast exams and mammograms. She encouraged others in their fight against cancer and reminded them that the survival rate is high for those with early detection. She also was very saddened by those young (and older) people who use tobacco in any form, as it raises the risk for all types of cancer and other diseases. If you live in Ketchikan, Southeast Alaska, or just have generous heart, you might think of donating to First City council on Cancer they were a great help in our fight and they are a great local organization. The following websites can give you more information.